So I was listening to the radio earlier and the presenter was offering ideas of what to do if you’re a football widow. Now I wouldn’t say I’m a football fan and the world cup is probably one of the only times I can tolerate football…but there’s a limit and I know about a week in ill be fed up with having to find ‘non football’ friends to socialise with, in fact I’m actually considering scouting for new friends to fill the spaces of the current ones who will be engulfed in the football! It’s awful how everyone and their dogs suddenly become fans of football just because it’s the world cup. 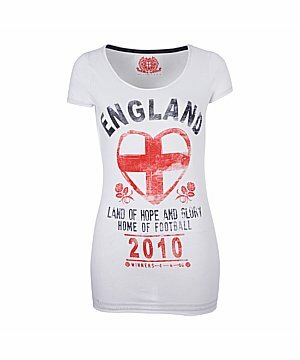 I was out shopping today and girls were actually purchasing England t-shirts and shorts – WHY??? Unless you’re a girl who actually understands the offside rule (whatever it is) you obviously don’t have a real interest in football and if that’s what a girls gotta do to get a guys attention during a football match surely it can’t be worth it!! The question therefore is will I be watching the England match today??? Call me a hypocrite when the line ‘if u can’t beat them, join them’ comes to mind but to be fair based on the rubbish that was on tv during yesterdays prime time match, its pretty much guaranteed that there will be even less on tv today. I wish there were a better option but I guess u gotta do what u gotta do to avoid being a social outcast!! ← Its All About The Free Stuff!